Shares of business management software specialist Pegasystems (NASDAQ:PEGA) trailed the market last month by shedding 15% compared to a 7% slump in the S&P 500, according to data provided by S&P Global Market Intelligence. The drop still left the stock in positive territory for the year, up 13% so far in 2018 versus the market's 4% uptick. Investors weren't reacting to any specific news from Pegasystems last month, but instead the stock appeared to be caught up in the spiking market volatility. Those price swings were especially large for stocks that, like Pegasystems, had posted market-thumping returns earlier in the year. If investors were worried about a potential growth slowdown for its fiscal third quarter, those concerns were recently put to rest. 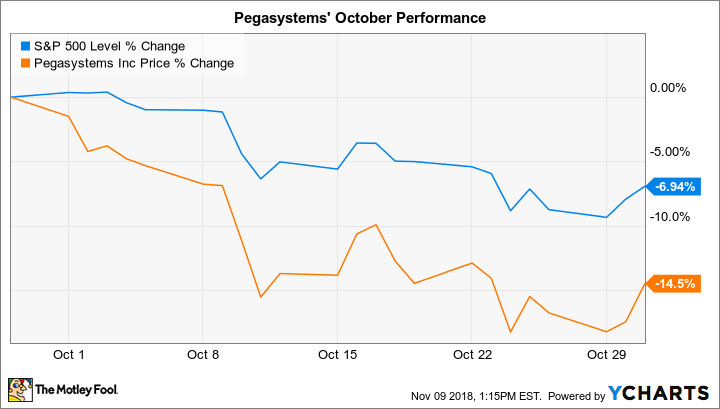 Pegasystems in early November revealed solid sales gains for the period, along with a few other encouraging financial trends including rising gross profit margin and increased order backlog. The accelerating shift toward its cloud-based subscription services is reducing reported revenue and earnings right now, and that's making the stock look expensive using traditional valuation metrics. But management believes that the move will ultimately result in rising profits and stronger cash flow.